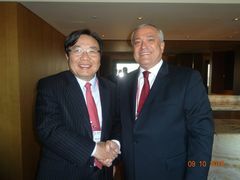 During ASEM Symposium, Mr. Mircea Ciopraga, TRACECA Secretary General and Mr. Wencai Zhang, Vice-President of the Asian Development Bank discussed possible ways of cooperation. During discussion with Mr. Zhang, Mr. Ciopraga added that during long period of time TRACECA participated and involved in the events initiated by ADB, particularly in the CAREC meetings. At the same time Mr. Ciopraga emphasized long-term cooperation with International Financial Institutions and their active involvement to TRACECA events and meetings. Parties mentioned the necessity of sharing experience and touched the issues of the implementation of new projects for development of the corridor and member-countries of the IGC TRACECA.